10 Things You Might Not Know About STAR TREK: FIRST CONTACT | Warped Factor - Words in the Key of Geek. 1. After the box office success of Star Trek: Generations, producer Rick Berman tasked Brannon Braga and Ronald D. Moore to develop the eighth Star Trek feature film. It was to be the first not to feature any of the original crew, and Berman heavily suggested that the duo should "think about doing a story involving time travel". Braga and Moore, meanwhile, both wanted to use the Borg. "Right on the spot, we said maybe we can do both, the Borg and time travel,"
"The Borg were really liked by the fans, and we liked them. They were fearsome. They were unstoppable. Perfect foils for a feature story." 2. In deciding to combine the two story ideas, time travel and the Borg, the big question the duo faced was identifying a suitable time period to which the Borg could travel to. Berman's suggested the Renaissance, with the Borg attempting to prevent the dawn of modern European civilization. And so the first story draft, titled Star Trek: Renaissance, had the crew of the Enterprise track the Borg to their hive in a castle dungeon. The film would have featured sword fights alongside phasers in 15th-century Europe, while Data became Leonardo da Vinci's apprentice. 3. 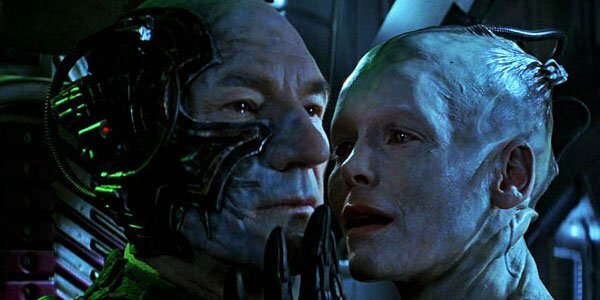 As the treatment for Star Trek: Renaissance progressed, an extended segment would see the Borg 'assimilate' themselves into period costume to blend in! Moore, wisely by the sound of it, became increasingly worried that it was getting "campy" and over-the-top. Patrick Stewart, who had wanted to take a more hands on role in the story development after coming in at the last minute on Star Trek: Generations, was asked his thoughts on the proposed plot. Receptive to the time travel/Borg aspect, his primary concern about the Renaissance period was that he'd end up wearing tights! Something he flat out refused. "that, to me, is what made the time travel story fresh." 4. With the idea of Star Trek‍ '​s genesis in mind, the central story became Zefram Cochrane's warp drive test and humanity's first contact. Drawing on clues from previous Star Trek episodes, Cochrane was placed in mid-21st century Montana, where humans recover from a devastating world war. In the first script with this setting, the Borg attack Cochrane's lab, leaving the scientist comatose; Picard assumes Cochrane's place to continue the warp test and restore history. In this draft Picard has a love interest in the local photographer Ruby, while Riker leads the fight against the Borg on the Enterprise. "It just didn't make sense [...] that Picard, the one guy who has a history with the Borg, never meets them." So Riker and Picard's roles were swapped, and the planetside story was shortened and told differently. Braga and Moore focused the new arc on Cochrane himself, making the ideal future of Star Trek come from a flawed man. At this time the script went under the title Star Trek: Resurrection, and the idea of Borg fighting among period costumes coalesced into a "Dixon Hill" holographic novel sequence on the holodeck. 5. A second draft of the proposed 'Resurrection' script saw the inclusion of John de Lancie's omnipotent character Q. Although the character never made it into the final draft, at this time Paramount were suitably impressed enough to award the film with a budget of $45 million, $10 million more that Generations was granted. This would allow the production to plan a larger amount of action and special effects, and so the movie became the first Star Trek film to make significant use of computer-generated starship models, though physical miniatures were still used for the most important vessels. 6. The planned title of Star Trek: Resurrection was scrapped when Fox announced the title of the fourth Alien film. Multiple other titles were considered, including Star Trek: Borg, Star Trek: Destinies, Star Trek: Future Generations and Star Trek: Generations II. But on May 3rd 1996 it was settled that the eighth big screen Star Trek feature film would go under the title Star Trek: First Contact. 7. Jonathan Frakes was not the first choice for director, as both Ridley Scott and John McTiernan reportedly turned down the project. Patrick Stewart later claimed he met with another 'big name' director, but felt "he didn't know Star Trek" suitably enough to trust him with the project. So Frakes landed the job after directing several successful small screen episodes of The Next Generation, Deep Space Nine and Voyager. First Contact was to be Frakes cinematic directorial debut, and in a delightful parallel he also, of course, plays Riker, the Next Generation's First Officer. Twelve years earlier the Original Crew's First Officer, Spock as played by Leonard Nimoy, made his cinematic directorial debut with Star Trek III: The Search for Spock. Both actors would go on to direct two Star Trek films in a row. 8. James Cromwell was cast as Zefram Cochrane, the pilot and creator of Earth's first warp capable vessel. The character of Zefram Cochrane had first appeared in the Original Series episode "Metamorphosis", played by Glenn Corbett. Here, though, Cromwell's Cochrane is much older and has no real resemblance to Corbett, which did not bother the writers as they wanted to portray Cochrane as a character going through a major transition; he starts out as a cynical, selfish drunk who is changed by the characters he meets over the course of the film. Although the character was written with Cromwell in mind, Tom Hanks, a big fan of Star Trek, was approached for the role by Paramount first. He was receptive to the idea but had already committed to the film That Thing You Do! and had to reject the part. 9. As an android Data should've looked the same throughout the Next Generation run, but, understandingly, Brent Spiner's natural aging made this impossible, so a possible story idea was considered for this movie that would see Data's skin being completely removed by the Borg. This would have a two-prong possibility going forward, either replace the 'skin' with an aged Data/Spiner, or give the producer's the option of recasting the character with a younger/cheaper actor in the role. Either way it was nixed! The idea morphed into the Borg Queen giving Data some human skin to gain his trust. 10. 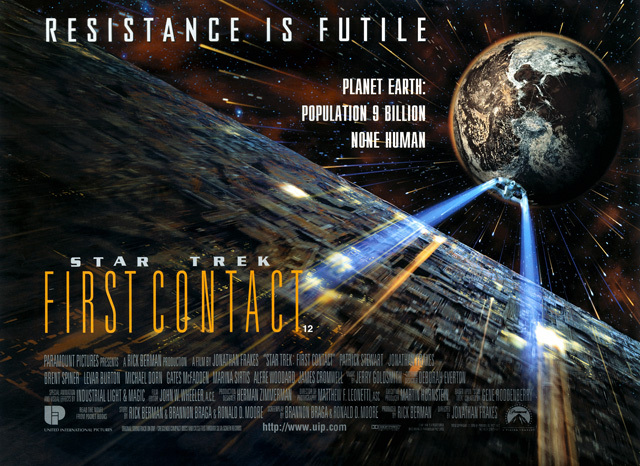 Star Trek: First Contact opened on November 22nd 1996, grossing $30.7 million in its first week in the US alone. Within a month that total had reached over $77 million. With a final $146 million worldwide cinematic take, First Contact became the best-performing Star Trek film from the original run of the series, only surpassed in 2009 by J.J. Abram's reboot.